" Someone has rightly remarked that positive attitude can lead a person to victory. " It is a very positive attitude with which Shri. Deendyal Sahu, S/o Shri. Rajjulal ji Sahu the founder of Jhoomarwala, which is amongst the most prominent name in lighting Industry. 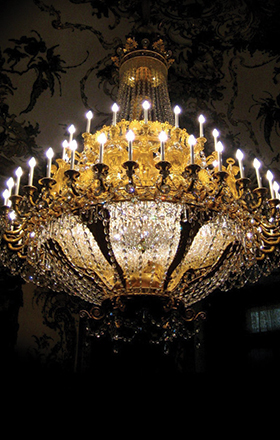 Naveen Sahu and Nishant Sahu in Hindi stand for leaders in Chandeliers and Lighting Industry. Jhoomarwala was founded in 2005 and its founder was the most disciplinarian of his times. He was much-admired all over iteration with success and prominence & given number of awards for exceptional performance. The Founder's prudence and this bequest is maintained by his sons lead by Naveen Sahu and Nishant Sahu have worked & still working in the similar directions to fulfill the dream of father. Going ahead, We reinstated our obligation to customers providing the best possible lighting solutions for your Special Needs. We are enthusiastic to providing proficient lighting service with eminence lighting products. Our showroom features lighting products ranging from chandeliers, indoor lighting, LED Products, table and floor lamps, Outdoor lighting, Up lighter, lamp shades, and accessories for your home decoration. Lighting is one of the easiest, quickest and most reasonable ways to make brighter and add comfort to your interior places. Today, most people have enhanced their homes with lighting products, and millions more have enjoyed the remuneration at department stores, hotels, offices, and customization facility. Our lighting business brings up light to the world, with advance new technologies such as fluorescent lighting that manage with more effectiveness, less environmental brunt and less cost than ever before. Our vision is to develop into a top lighting products supplier in the world offering cost emphatic lighting solutions that heighten the lifestyle of the customer. Jhoomarwala operates on its substantive principles magnitude for its community and a strong commitment to a clean environment.